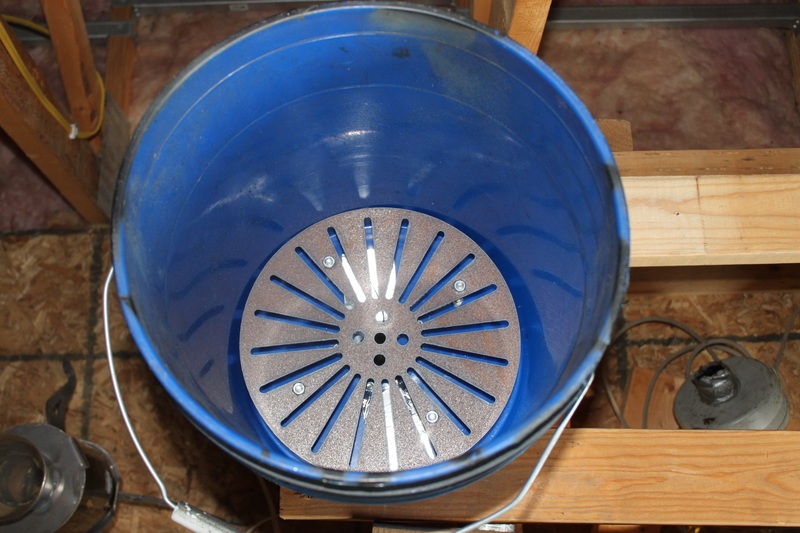 After eleven hours the bucket and contents stopped losing weight and remained constant so that is probably as dry as I can get them. The temperature in the barn ranged from 70-95F during the experiment and the weather outside was dry, full sun, and 75F. This morning I tried to dry the fuel more but the weight still remained the same. Since this is obviously as dry as it is going to get let’s see how well we have done. For the second part of this experiment I took a 134g sample from the center of the bucket and dried it in a 240F oven until the weight remained stable. After two hours the weight stopped dropping and held steady at 122g. I am defining this as my “dead dry” weight. That means that 12g of water was evaporated in the oven. Going into this morning’s experiment the wood was therefore 12g/122g = 9.8% moisture on a dry basis. 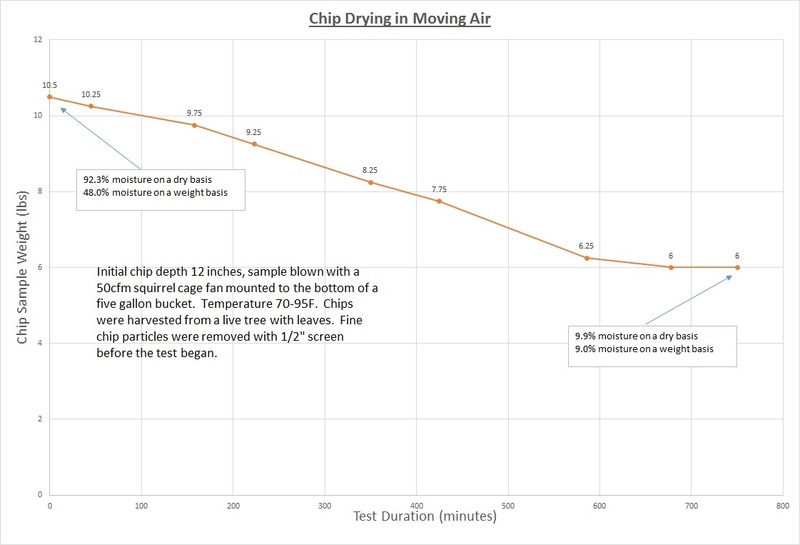 This is very close to the results I got when I dried my chips in still barn air for five days(8.9%) and fine for gasifier fuel. 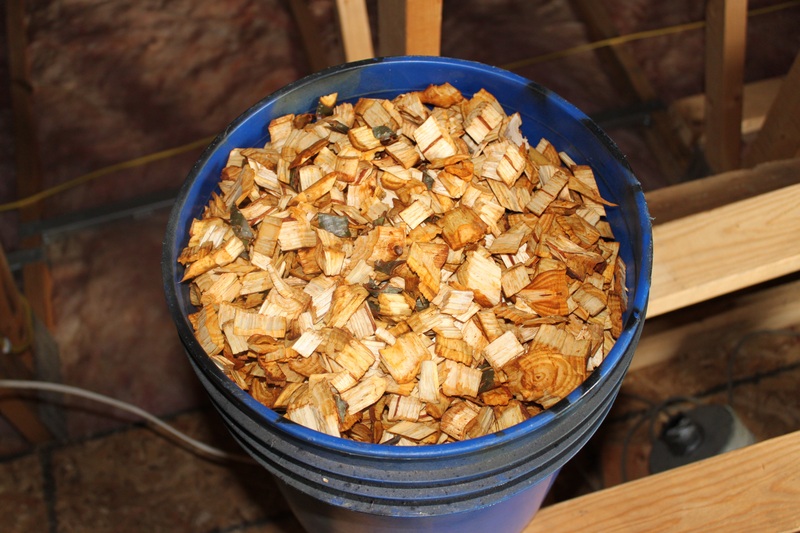 Looking back at yesterday’s test that means that the 6lbs of mostly dry chips that were left at the end had (6lbs*(122g/134g))=5.46lbs of “dead dry” wood in them. 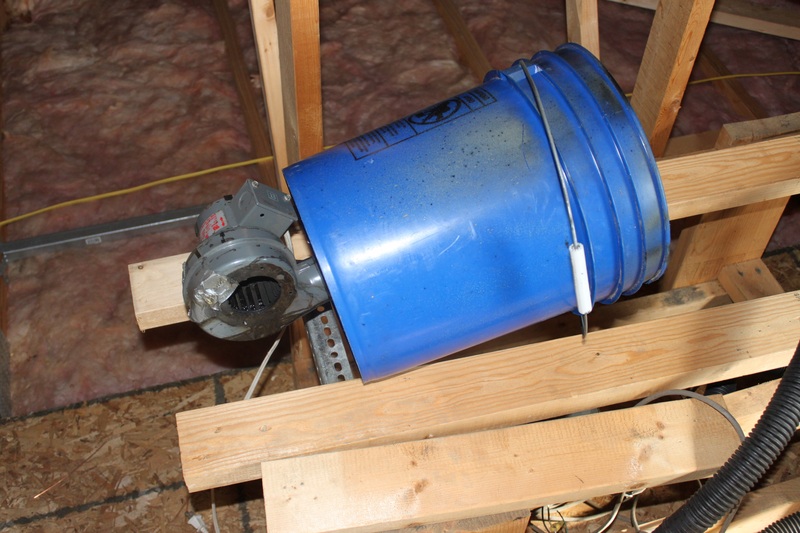 (10.5lbs-5.46lbs)=5.04lbs of water was present in the initial sample that came out of the chipper. That means that the chips coming out of the chipper were (5.04/5.46) = 92.3% moisture on a dry basis. That’s pretty soggy!!! Not knowing what the RH was in your barn, I would guess that if you had a lot of time at 95 deg F would could reach an equilibrium moisture content of 18% or so. You need higher temps to start pushing out the inter cellular water. It would be interesting to mix up the chips when they stop losing weight and continue the process. If you did have additional weight loss you could assume that you did have some channeling of the air flow. and look at “Wood-Water Relationships”. This is “on a dry basis” which makes the numbers look weird. It’s water weight/bone dry wood weight. If the weights are equal the ratio becomes 100%. I hate it, but it’s the standard. Thanks for the clarification! I’ve never seen a dry basis measure of wood before, didn’t know it existed. Guess I learned something today…. I hit “Reply” to a Constance question but it didn’t give me the indented response the way this page is doing. DOW doesn’t do indented responses. It’s an inline format.